Not all of my projects turn out the way I imagine them and it seems like recently I have had more failures than successes! Since I have been proudly showing off my successful projects on my blog – I guess it is only fair that I should show a few of my recent not so successful projects. A couple weeks ago I attempted to build a stool from reclaimed pallet wood that just didn’t come together the way I thought it should — I haven’t given up on it but I did have to set it aside so I could re-think my idea. 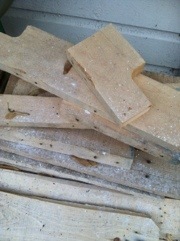 For now it is just a pile of wood for my husband to complain about. 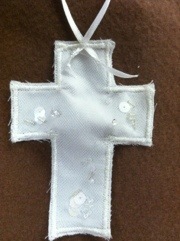 I tried to sew a fabric cross from leftovers from the veil I made for my niece. I thought I would attach it to a card and it would be a little keepsake. Unfortunately it really didn’t look like a cross when it was done!! 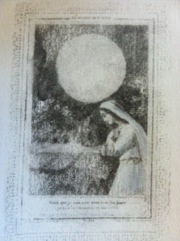 My next fail was an attempt at an image transfer. I had noticed that the product Goof Off contained xylene – which is the same ingredient that is in the blender pen that I used to transfer a photo to a canvas. Same ingredient yes, but it evaporates too quickly and when I really saturated the paper the image blurred – it did sort of work but not very well. It might be an option for less detailed images. Yet another fail started out really well. 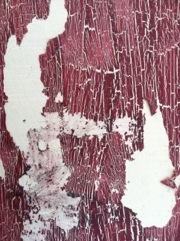 I was experimenting with paint and glue to create a crackle finish and I had great luck with kids school glue. I wanted to make a weathered looking sign for my bar so I printed out the lettering and was using another transfer method with ink jet printouts and water — oops! School glue is washable so when it got wet it turned to mush and the beautiful crackled paint peeled right off! Luckily no one was around so I was able to swear and stomp around. My most recent project isn’t exactly a failure – it didn’t turn out as well as I had hoped but it was meant to be a test run for another project. I want to make teddy bears from old clothes but since I have never made a teddy bear I knew there would have to be some experimenting before I would get it right! 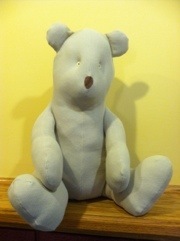 So this bear is an experiment and a bit of a failure (sorry teddy.) I will do better on my next attempt but this guy did what he was supposed to do – he gave me a chance to learn. In the end all of my projects really are a success – if I enjoyed the process, or learned something new. I enjoy making things! So – I will start a new project and maybe it will turn out exactly the way I envisioned it, or maybe better than I imagined — or it might just be a FAIL! I have an idea for the pallet of wood! Julie- They do make a fabulous fire. Of course they must be obtained by legal means! Actually that teddy bear is kinda cute. And if you really really don’t like it, I’ll bet it could be a good dog toy? So, it’s not a failure! Carol – He really isn’t too bad, my daughter has rescued him so he won’t be homeless!